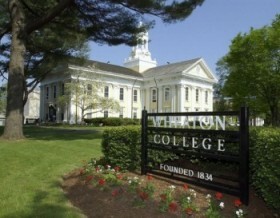 Wheaton College, located in the quintessential New England town of Norton, Massachusetts is pleased to offer unique accommodations for business meetings, conferences, camps and social events conveniently found off Interstate 495 between Boston and Providence. Wheaton College Conference and Event Services strives to be your one-stop shop for all your event needs. At Wheaton you will find state-of-the-art meeting facilities, with several meeting spaces fully media equipped. Our event facilities can accommodate groups as small as 10 or 15, and as large as 700 and everywhere in between. Both air-conditioned and non air-conditioned residence halls provide on-site housing to event guests during the summer months. Amenities such as a newly renovated fitness center, wireless internet and an on-site book store for your last minute needs, make hosting your event or conference at Wheaton that much more enjoyable. Superb service is our goal as dedicated Conference and Event Services staff are on site to ensure that the details of your event are carefully constructed and facilitated by our in-house service providers. Bring your next event to Wheaton!